That’s how I described Tai Chi a decade or so ago. This ancient Chinese moving meditation/ exercise is repetitive and slow and was of no interest to me. I was a dance major in college, practiced karate for years and tend to be a hyper person. I like movement with a capital “M”. But residents at Kendal were interested in learning Tai Chi. The exercise helps improve balance and flexibility, strengthens the core, reduces stress and creates mindfulness. It has benefits for people with arthritis, back pain and osteoporosis and is being incorporated into many corporate health and wellness programs, and is now attracting millennials. So, I checked it out, and well—and this is not an exaggeration—it changed my life. I don’t just teach it, I live it. It’s part of my daily life. It has helped me calm myself down in every way, and helped alleviate pain caused by my rheumatoid arthritis. It’s very meaningful to me, almost spiritual. 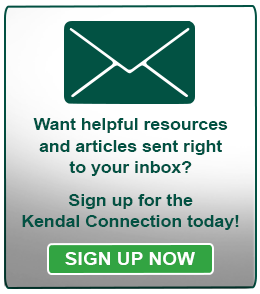 I start my day by doing about 20 minutes of Tai Chi at home, then come to Kendal where I often teach a Tai Chi class. We offer Tai Chi classes in the water and in the exercise room, both standing and in a chair—six classes in all each week. Water Tai Chi, called Ai Chi, has an added benefit of allowing participants to utilize the resistance of water. 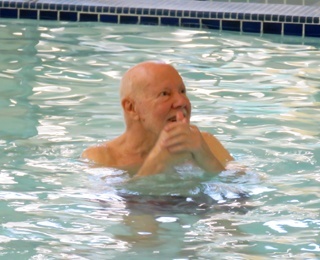 We practice in our 95-degree therapy pool, another big plus for residents. We stand in an open-legged stance, knees slightly bent, water up to our necks. Everything moves from this open stance. You want to feel like you are grounded to the bottom of the pool. “Vertically grounded and horizontally expansive” is what I tell my students. We do a series of flowing movements, first with our arms, then with our arms and legs, always keeping our arms under water. We move in one direction 10 times, then the opposite direction, then alternate, following our breath as we move. We do 12 different movements, and there’s a lot of slow, mindful pivoting and some twisting. It takes a good month to find your sea legs and strengthen your stomach muscles. As the movements are committed to muscle memory, the mind quiets as the body flows naturally. The postures have soothing names, such as “gathering” and “accepting with grace.” I give brief prompts, but try to talk as little as possible so students can focus on letting their body follow their breath. Students count silently, which is a good way to quiet the mind. We do exercises for 45 minutes and then float in silence for 15 minutes, using noodles to keep us afloat. For many of us including myself, sitting still to meditate can be challenging. I find that it’s much easier, after spending 45 minutes moving slowly and intentionally, to still my body and my mind. Residents are so committed to the practice that when I’m away, they continue to meet. I have posters illustrating Tai Chi movements hanging on a wall by the pool, but many residents know the exercises by heart. People often incorrectly think Tai Chi is a religion. The practice has its foundation in Chinese philosophy, which stresses that everything is dependent upon everything else and that harmony is the basic principle of existence. The Chinese call this oneness of all that exists the Tao, and Tai Chi is a moving representation of this oneness. What I stress to my students and would tell anyone interested in trying Tai Chi, whether in water or on land, it is not to be so wedded to what’s right or wrong. Part of Tai Chi, and all movement, is listening to your body. Nothing has to be perfect and it should feel good. It’s important to move within your body’s normal range...ever so gently stretching and opening further. Expanding…not tightening. If you are struggling, you need to make an adjustment—for instance, standing with less of a bend in your knees. You can always make modifications so the practice is less or more challenging. And when you are practicing on land, you can always do the exercises sitting in a chair or using the back of a chair for balance. Initially when people first start Tai Chi, they often tighten their neck, shoulders and face. But over time, I see nice, relaxed faces, even some smiles. I think that’s one of the beneficial aspects of movement in general—it helps us release that gripping tension in our body. Tai Chi makes me smile too, thinking how I once equated movement with jumping, almost like I was flying through the air. My dance teacher told me that my strength was in the slow stuff. Turns out he was right. For detailed information about fitness classes at Kendal at Oberlin, including schedules, call 440-775-9851 or contact us online. To schedule learn more about our life plan community, including our fitness resources, call or contact us online.